Food Hunter's Guide to Cuisine: House of Tricks; A Restaurant Gem In Downtown Tempe! House of Tricks; A Restaurant Gem In Downtown Tempe! As a food writer I get to attend a lot of delicious events and meet a lot of interesting people. 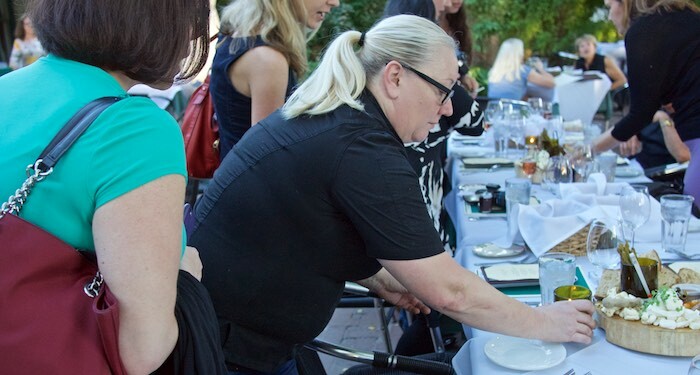 Last week several media professionals and myself were invited to dinner with long standing Tempe restaurateur Robin Trick & House of Tricks Chef Andrea Bales. Located in a charming remolded 1920's cottage, within walking distance to downtown Temple, House of Tricks serves a seasonally inspired menu featuring locally sourced items. Guests can enjoy a romantic dinner inside the vintage house or dine alfresco at a candlelit table for two underneath a canopy of trees. 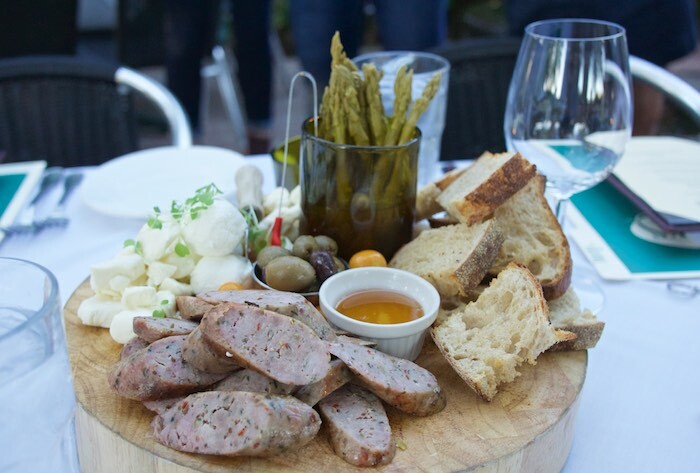 Our evening started with an antipasto board showcasing sausage from Schreiner's, Crows Dairy goat cheese, bread from Noble bakery and olives from Queen Creek Olive Mill. Robin shared with us stories of the restaurant's beginning, as we dined on contemporary dishes created by Chef Bales. 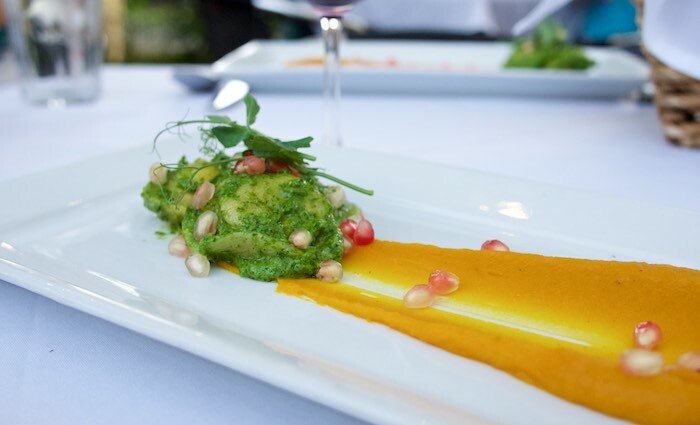 My favorite of the evening was the delicious handmade pasta filled with local goat cheese that was dressed in an arugula pesto and served alongside a Kuri squash puree. 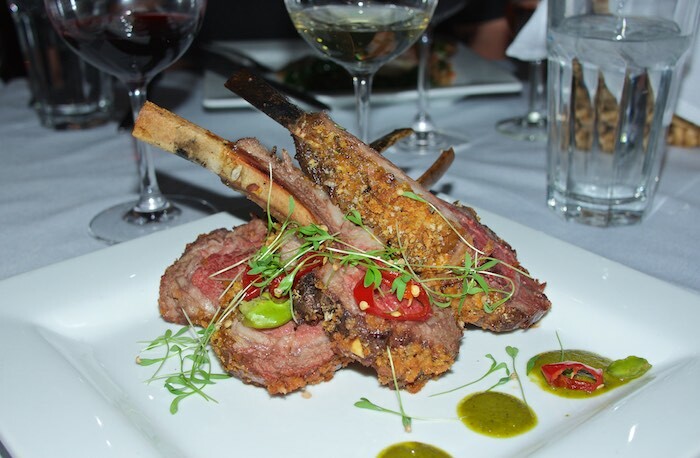 The almond crusted rack of lamb with fava bean cakes and mint cilantro chimichurri was well received by our group. 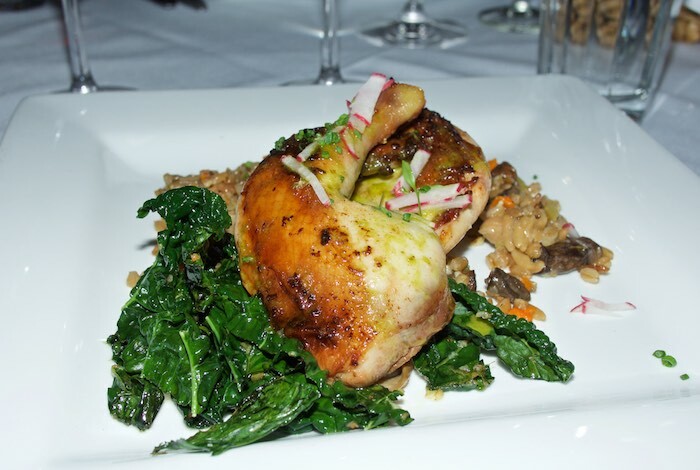 As was the brick roasted game hen served with wilted Tuscan kale and a wild mushroom pilaf. 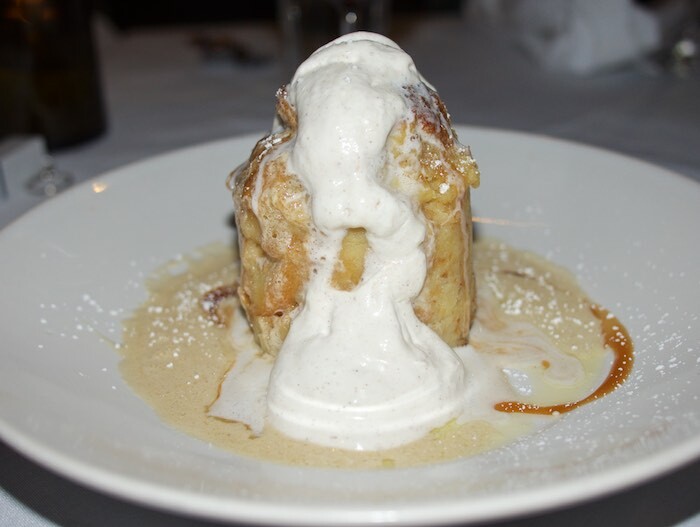 We ended our dining experience with a fabulous salted caramel apple bread pudding served with house-made cinnamon whipped cream. 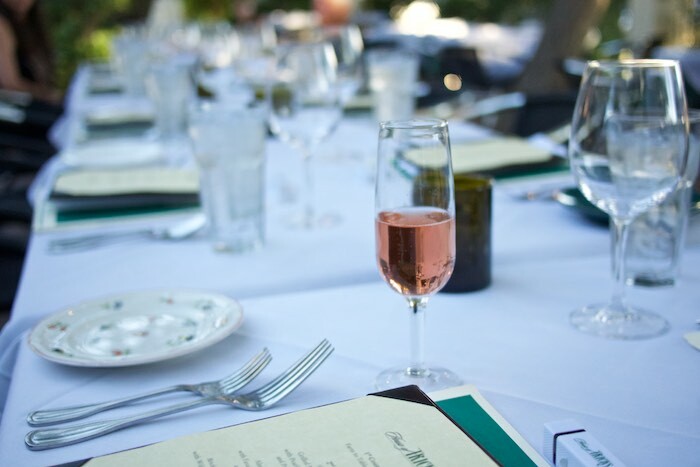 The impeccable quality of the food and the quaint atmosphere of this gem of a restaurant, in my opinion, is what separates House of Tricks from other dining options in the area and keeps locals coming back again and again. Oooh. Everything looks amazing! I want a little bit of everything in those pictures. I would totally love to dine alfresco there. There is just something about having a lovely dinner under the trees. All the dishes look fantastic! I especially have my eye set on almond crusted rack of lamb. Yum! Wow! What a fun event you went too. The dishes all looked so beautifully presented and I am sure, taste amazing! That caramel apple bread pudding would be a must for me. Saw this on your Instagram and loved reading more about it. That salted caramel apple bread pudding looks amazing! Nice..the event sure does sound fun. Great pictures too. This looks like a nice event. I love dining outside. This looks like an amazing spread! I am drooling over that salted caramel apple dessert! We still need to try them out! We just never make it to Tempe! Maybe we should hit Happy Hour together! I'm literally drooling over the almond crusted rack of lamb with fava bean cakes and mint cilantro chimichurri. What a feast, really! when I make it to Arizona, this will definitely be on my list to try! What gorgeous food, I can just imagine sitting under a canopy of trees and enjoying it! ooo The almond crusted rack of lamb looks and sounds amazing! Sounds like a great evening out on the town to taste test the BEST!! It all looks amazing!